Serendipity Reviews: I've been tagged! I can't believe this is my third post in a day! The post below is a really funny video of Todd Carty on Dancing on Ice. He skated so badly, he went off the stage. I have watched it so many times, so please if you have time do watch it as the ending is the best! I have also reviewed Dawn French's autobiography, so do please read if you have a mo. This post is because I have been tagged by my friend Jo at Crafting and Allotmenting. I have never been tagged before so thank you Jo. This is a fun tag. You have to go to the photo's on your PC, go to the 6Th folder and find the 6Th picture and upload it to your blog, and here is my picture. This is a bit too coincidental as this picture is of my nan, who has had a very bad week. She broke her hip on Sunday and is presently in hospital awaiting an operation. I will be travelling to see her at some point this week. So get better soon Nan. I haven't tagged anyone else, as I really don't know who to tag. Not everyone puts pictures up on there blogs. So if you want to join in feel free and let me know by leaving a comment. 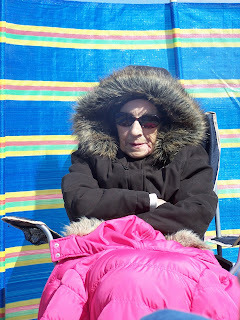 fun meme...if the pic on my pc is of me, i'll post it :) your nan looks like shes keeping warm! I hope your nan will be ok! Broken hips are not good at all.